Trion's upcoming MMORPG Rift: Planes of Telara may be a standard MMOG through and through (with a few new twists), but the publisher's other game, End of Nations is something we really haven't seen before. When I first saw the game in action, I remarked that it was part MMOG, part RTS, and part PokÃ©mon. Last week I had the chance to sit down and play it for a few hours, and as it turns out, my initial observation was right on the money. Set in a dark future where economic collapse triggers the fall of nations as we know it (see the title) and the rise of a one-world tyrannical state called the Order of Nations, End of Nations is being developed by former Westwood employees at Petroglyph and headed up by the man behind Supreme Commander, so it's hard to say that the developers don't have experience with making strategy games. But that's not to ignore the MMO part of it either. This isn't just a "(insert genre here) with MMO elements" like a persistent world map - though it does have one of those, too. I deployed my forces in the troubled Russian area of Magadan, a massive 20-square-mile adventuring area filled with Order bases in dire need of a few well-placed artillery shells. For all intents and purposes, Magadan and other areas like it are the equivalent of questing zones in "proper" MMORPGs. It's drop-in-drop-out at any time you want, there's a relative safe haven in a town where you go to get quests and rest/shop up, and there are plenty of Order patrols to kill on your way to get things done. 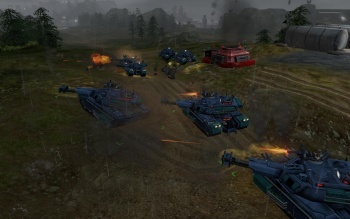 The missions themselves are more RTS standard - go there, kill this, blow that base up - and if there are any of the infamous "Kill ten wolves tanks" quests to be found, I didn't encounter any of them in my play time. There's no mistake, you are playing an MMOG, you just happen to be playing one that plays like an RTS - rather than controlling a single character, you're controlling a group of vehicles. There are still character classes, too. Tank Commanders are your, uh, tanks - designed to slug it out toe-to-toe with an enemy, to take as much punishment as it deals out. Artillery Commanders are the wizards, dealing potentially-devastating damage from range but being slow and vulnerable when deployed. Strike Commanders are the game's rogues, fielding squadrons of quick and nimble vehicles with powerful weaponry that blow up in a stiff breeze. As someone who is relatively experienced in both MMOGs and RTS games, End of Nations starts off feeling very (literally) divided. Half the screen is devoted to the RTS elements (your units and their commands), while the other half is what you'd consider the more MMOG side of things - items and your "commander powers" like airstrikes and temporary buffs. It's a bit confusing to get used to at first, because there's a lot of information on screen at any one moment. Of course, it didn't help that this was the first time I'd seen any of the hotbar icons and had to keep mousing over them to read the tooltip of "What does this do, again?"